Sometimes extinction can be a blessing. 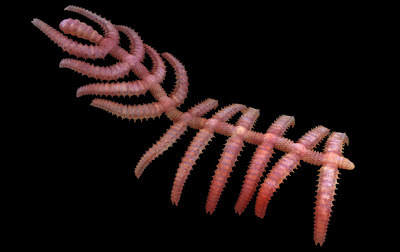 Aren't you glad this 500-million-year-old "walking cactus," for example, isn't alive today? It lived on the bottom of the ocean, to be fair. But just knowing it was there would have bothered me. Conservationists have been speculating for years that we're in the midst of a mass extinction. In the planet's history, five of these events have occurred. To qualify, three-quarters of all species on Earth must be wiped out. The most recent mass extinction was the one that did in the dinosaurs. Prior to that, incidents such as global cooling or global warming served to wipe out huge numbers of species. And before any of those events, when the planet was occupied by simple single-celled creatures, the rise of the first photosynthesizers released oxygen into the atmosphere and destroyed most other forms of life. So Earth is no stranger to slate-wiping events. But the great extinctions of the past occurred over hundreds of thousands, or millions, of years. Are humans, by spreading across every surface on Earth and pushing out the animals and plants that lie in our path, causing a new extinction event that's accelerated beyond anything the planet has seen before? Anthony Barnosky, a paleobiologist at UC Berkeley, says yes. Barnosky and his colleagues compared the current rate of extinction among mammals to their historical extinction rate (since mammals are well catalogued today and well represented in the fossil record). They also examined the historical extinction rates of groups such as amphibians and birds that have been thoroughly assessed by the International Union for Conservation of Nature (IUCN), the group that labels species as endangered. Rates of extinction today, they found, are clearly higher than normal historic rates. The researchers then compared all of these findings to the rates of species loss that drove the mass extinctions of the past. To project future extinctions, they looked at animals that are currently "threatened"--labeled by the IUCN as critically endangered, endangered, or vulnerable (more on that in a moment). If all threatened animals became extinct in the next hundred years, and we carried on at the same rate of species loss afterward, it would take between 240 and 540 years for 75% of species to be wiped out. That is, within just a few centuries, we could see a legitimate mass extinction. The good news is that this outcome is far from certain. While a "critically endangered" species is defined as having only a 50% chance of surviving the next ten years--meaning its prospects for the coming century are pretty grim--a "vulnerable" species is considered to have only a 10% chance of extinction over the next hundred years. So for all currently threatened species to be gone within a hundred years would be, by the IUCN's definitions, very unlikely. The point stands, though. Even if only the critically endangered animals disappear in the next hundred years, and if that rate continues, it will take some hundreds or thousands of years for us to reach the 75% mark--rather than the hundreds of thousands or millions of years seen in the five mass extinctions. This is species loss at a completely unnatural rate. And it's our fault, in case you were unclear. The authors list changing atmospheric conditions, global warming, habitat loss, pollution, overhunting, overfishing, invasive species (carried by humans to places they don't belong) and "expanding human biomass" as reasons for the extinctions. The sheer weight of us on the world is, it seems, too much. But the future isn't certain. If we care enough, we might be able to beat the odds.